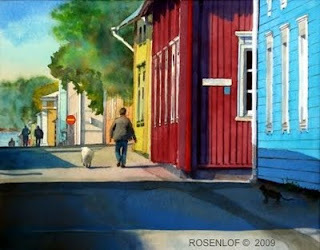 These two townscapes are show the colorful town of Kristinestad on the western coast of Finland. It is a small town of wooden buildings and narrow streets with a great seafaring tradition. This is a typical Finnish forest landscape. The only thing missing is a view of water through the trees. My painting "Park Ridge Bank" won the High Achievement Award at the Pascack Art Association Annual Member Show. The painting is "watercolor on panel" so it can be displayed without glazing. The image is 5x7". The frame is 8x10"
These watercolors are from the colorful town of Kristinestad in Finland.